Today’s Guest is Shirley from What about Second Breakfast, a blog where you see a good selection of Asaian recipes like rice dishes, noodle dishes and curries but most importantly a lot of amazing baking! Just look at this braiding perfection, this decadent goodness and this chocolate sensory overload. I guess I will let those posts speak for itself. Anyway for today it’s not about baking its more about heritage which I guess we offer a lot here at Ang Sarap hence we have this really nice Asian dish called Fen Si by Shirley. I’m Shirley of What About Second Breakfast?, and I’m honored to be guest-posting for Raymund! Ang Sarap is always looking good, and Raymund has tackled more Asian recipes, across the many cultures, than anyone I know. I’m a copy editor and staff writer at The Boston Globe, and occasionally review restaurants south of Boston. My personal blog is heavy on baking and other desserts, but for Ang Sarap I turned to my heritage. I’m a native New Yorker, but my grandparents were from China and my parents were born in Singapore and Malaysia. I don’t think there are enough fen si recipes out there. Rice vermicelli seems to get all the attention, popularized in dishes like Singapore mei fun. Fen si is also known as mung bean vermicelli or glass noodles, the latter of which sounds prettier and refers to its opaque appearance. The noodles made of mung bean starch are slippery, bouncy, and smoother than the vermicelli made from rice. Fen si is often made with ground pork, which is the way my mom cooks it. This recipe is derived from hers, but I substituted shrimp for the pork and added carrots and bean sprouts, which I would never have eaten as a kid because I was picky and hated vegetables. This fen si is a simple dish but comforting, and reminds me of my childhood days. If you must amp it up, you can go my dad’s route and pour on the hot sauce. Hope you enjoy it. Soak the fen si in hot tap water for 10 minutes, then drain and set aside. Don't use boiling water, which would overcook the noodles and make them mushy. Heat a wok or skillet with high sides over high heat, then add a teaspoon of canola oil. Swirl to coat the wok with the oil. You might need more oil if your cookware is not nonstick. Add the shrimp, cooking for about 1 minute, flipping them halfway, just until they are pink and cooked through. Move the shrimp to a plate and set aside. Add the bean sprouts and stir-fry for 1 minute, then move them to the plate with the shrimp. Add the other teaspoon of oil, then add the carrots and stir-fry for 1 minute. Add the garlic and stir-fry for another 30 seconds. Add the fen si, soy sauce, sesame oil, black pepper, oyster sauce, and chicken broth. Stir for 3 minutes, until the noodles absorb the broth and the fen si is tender but still firm. Return the bean sprouts to the wok and toss everything together. Serve the noodles in bowls topped with the shrimp. Garnish with cilantro. This is a beautiful dish. I just bought some of rice vermicelli, now I’ll have to keep my eyes open for fen si. I know this is a dish my family would enjoy and I have two boys that will be adding hot sauce for sure. 🙂 Pleasure to see you on Raymund’s site Shirley. Thank you, Kristy! Hope you and your boys like it. Thanks, Kay! Shrimp is a favorite of mine too. It’s true, it can turn out too firm or mushy if not cooked right. Thanks! Super dish! And wonderful guest post – thanks so much. So very nice to meet you Shirley! 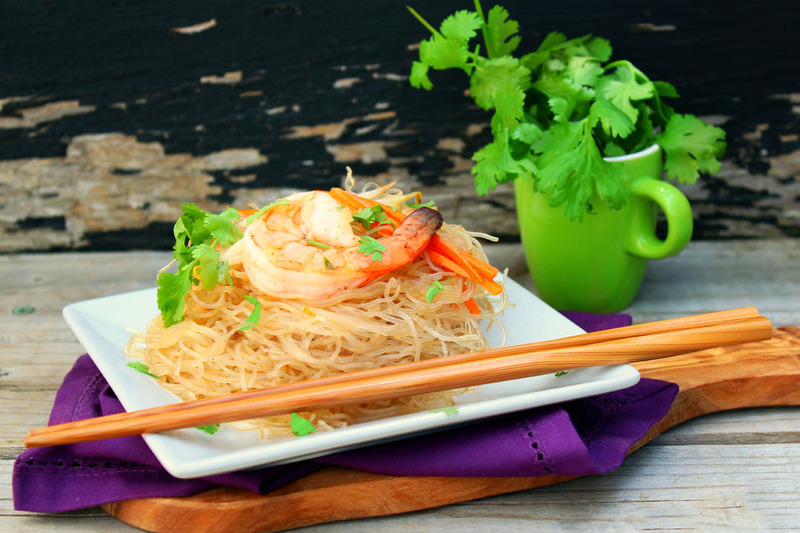 Great guest post and I love your Chinese Glass noodle dish! Easy and delicious! I love Shirley! Great to see her on your blog, Raymund! I love Fen Si, and great with shrimp!